I have just returned from an excellent Workshop on Traditional Korean Medicine sponsored by the Government of the Republic of Korea. Run by the School of Korean Medicine of Pusan National University it was attended by official delegates from 12 countries including Ireland, Switzerland, France, Germany, Romania, Thailand, Vietnam, Australia, USA and Canada. It was very interesting to learn about another branch of Oriental Medicine and to compare experiences with other experts in the field. 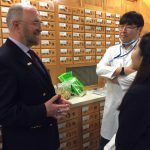 We saw the medicine in action in hospitals and clinics in various parts of South Korea and learned about its principles and practice from highly qualified Doctors and Academics. I am grateful to the South Korean Government for the opportunity to represent Ireland at this superbly organised event and to all the staff at Pusan National University who made the trip so hugely informative, memorable and enjoyable.